Rebuilding Somalia – “The sea is our future” – Paper Never Refused Ink! Reproduced here with the kind permission of the Editor of An Cosantóir, this is my Article which featured in the May 2017 edition. This article will also feature in the upcoming edition of Emergency Service Ireland magazine. The horn of Africa for decades has been a much-troubled location. Recently Paul O’Brien MA delivered an overview of the conflict in this publication and in this follow-up article, I will focus on the efforts underway to rebuild the country. A lasting peace will be built not only by the absence of conflict but by resetting the foundations of the state; this must bring together many different interconnected parts to provide a place where a functioning government can use its natural resources for the benefit of all its citizens. One of the greatest resources open to Somalia is the sea. They have the longest coastline on mainland Africa and in the middle East, at 3,025km. The waters off Somalia have become synonymous with piracy and lawlessness, yet this will be one of the key areas where economic activity is brought back to the impoverished country, which is balanced on a knife edge with regards to its own security and stability. We in Ireland know that the ocean harbours great rewards; if it can be fished or farmed and traded across with certainty, safety and creativity. However, to be able to protect the ocean’s wealth, that state must be able to project its authority out onto the sea. This is no easy thing to achieve in the complex political climate of Somalia. Federal Somalia, in theory, consists of the following states Puntland, Glamudug, Jubaland, South West State, Hir-Shabelle, Somaliland. A prime example of the difficulty in creating a federal government is that Somaliland declared independence in 1991 and has no relations with the Government of Somalia. Despite that, no country has recognized Somaliland’s independence. 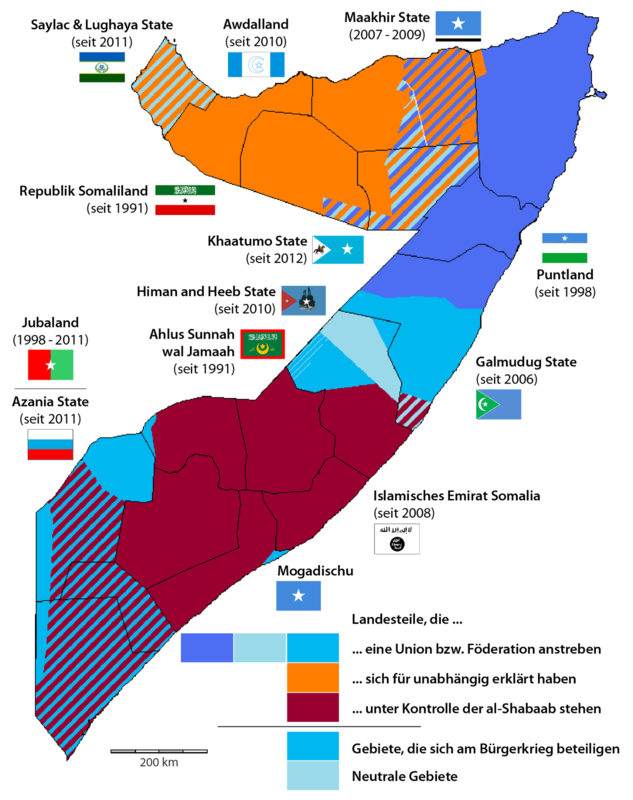 Above: A map showing the various political regions of Somalia. 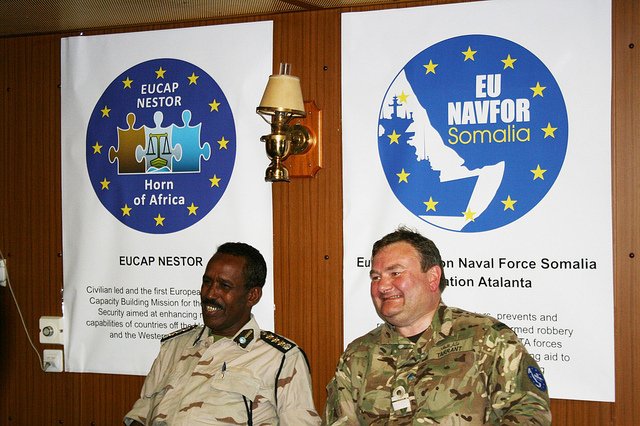 In support of the Federal Government there are three separate EU missions where created; EU’TM Somalia’, ‘EU Naval Force Somalia Operation Atalanta’ off the Horn of Africa, and ‘EUCAP Nestor’. The European Council announced in 2016 that they were prolonging the mandate of the civilian mission of capacity building EUCAP and the military training mission EUTM, both until 31st December 2018. Only recently on the 1st of March 2017, the mission European Union Capacity building mission (EUCAP) was renamed from ‘EUCAP Nestor’ to ‘EUCAP Somalia’. There are 17 participating nations and the substantial budget was nearly €18m in 2015 and the mission has a planned capacity for nearly 180 staff. 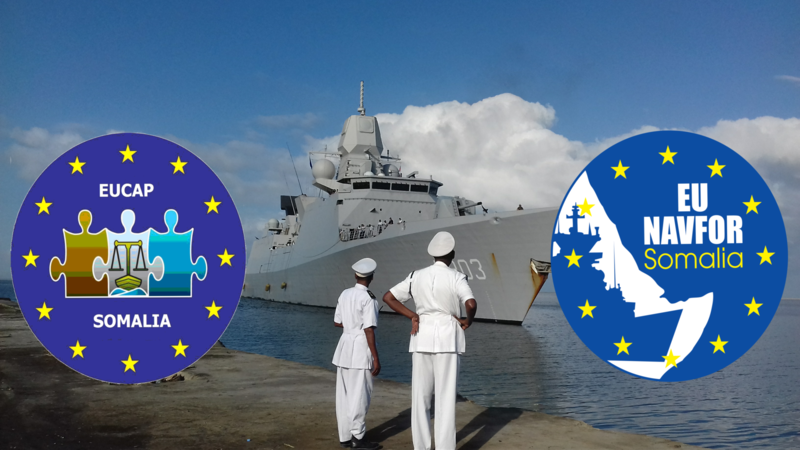 The objective of EUCAP Somalia is to assist this country in strengthening its maritime security capacity so that maritime law is enforced more effectively. The EU military mission EUTM Somalia contributes to the capacity building of the Somali National Army (SNA). EU NAVFOR Operation Atalanta, is the EU military operation countering piracy off the coast of Somalia. The operation was prolonged on 28th November 2016 until 31st December 2018. The EU has a comprehensive approach in Somalia based on active diplomacy and support to the political process, security support, development assistance and humanitarian aid. It aims to tackle both the symptoms and root causes of piracy. Above: Deputy chief of the Somali Navy, Admiral Ergada Badda and EUNavfor Operations Commander Admiral Bob Tarrant. An Irishman is playing a key part in this important work and the enormity of this undertaking is abundantly clear when you speak to the EUCAP Somalia, Head of Operations Mr. Chris Reynolds. He is on secondment from the Irish Coast Guard to assist in the EU efforts to build from the ground up this force, which will be able to protect the vulnerable fisheries and the ever-increasing trade which ply’s the waters of the Somalia exclusive economic zone. “My role is head of operations, which is divided into three sections. The first is Maritime Capacity building, the second is Policing & Institution building and the third is National Policy. And the other role I have is that I am head of field offices, we have three field offices Mogadishu, Garoowe in Puntland and Hargeisa in Somaliland”. 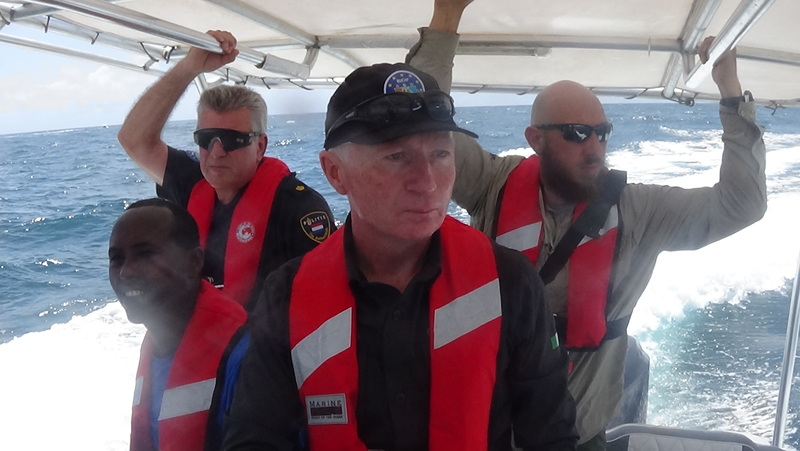 Above: Chris Renyolds is at the helm of a small craft onboard are EUCAP Somalia personnel including members of the Dutch Police who are assisting in the mission. Mr. Reynolds is very positive about the progress that has been made in a relatively short time. Somalian politics is nearly inseparable from it clans and in fact some of the main Somalian problems lies in the complicated nature of its clan-based politics. Claude Gonot, a Senior International Security Advisor for Scandinavian Risk Solutions has a great knowledge of the security situation in Somalia and gives his view that “Rebuilding Somalia will be huge and hard work. Clans and sub-clans are ancestral and omni-present everywhere and at all levels. Somalia remains in a condition of internal conflict, fragmentation and is complex politically. The partial exemptions are Somaliland and Puntland in Northern Somalia”. This fractured nature of politics and the lasting effects of 25 years of civil war presents an atmosphere in which it is very hard to create a climate for investment and growth. “To actually create business here is very difficult. Especially for people from the outside who want to have transparency in the banking , legal or policing system” Mr. Reynolds says as he outlines the pitfalls and the potentials of business. Harakat al-Shabaab al-Mujahideen more commonly known as al-Shabaab, “The Youth” is a Salafist jihadist fundamentalist group based in East Africa. In 2012, it pledged allegiance to the militant Islamist organization Al-Qaeda and is a further complication in an already volatile and muddled security picture. “The army and the police tend to try and control the towns and cities, while Al Shabaab have a lot of sway in the countryside. Farming is very difficult and there are reports of farmers paying Al Shabaab ‘taxation’”. “The people want to move on but it is a challenge, because it has been 25 years of people fending for themselves.”. However, efforts are under way to create the infrastructure needed to create the maritime industry growth. “They have three major ports, one in Somaliland called Berbera, one in Puntland called Bosaso and Mogadishu port itself”. There are other state actors who have an interest in developing these ports. UAE are interested in developing the ports in the north of course because of its proximity to it and Turkey is developing the Mogadishu port as its area of influence. This abuse of the fisheries industry was highlighted in first comprehensive report carried out since the 1980s released in September 2015 which shows that foreign illegal, unreported, and unregulated (IUU) fishing in Somali waters by foreign fleets is reducing fish stocks, and has caused widespread resentment among Somali coastal communities, threatening renewed maritime insecurity. Entitled ‘Securing Somali Fisheries’, the report shows that IUU fishing vessels catch over 132,000 metric tons of fish each year, while the Somali artisanal fleet catches only 40,000 metric tons. The report is produced by Secure Fisheries (www.securefisheries.org), a program of the One Earth Future Foundation and developed as part of Oceans Beyond Piracy (www.obp.ngo). 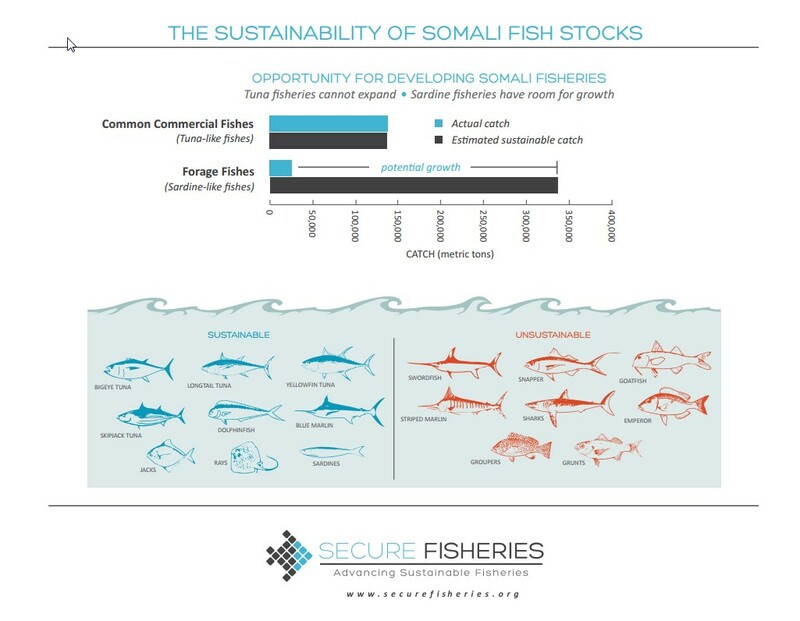 Above: A diagram from the Secure Fisheries report which indicates the sustainability of Somali fish stocks. The report shows IUU fishing has been a problem for decades. During the 1990s, IUU fishing was a justification for pirate attacks in Somali waters. 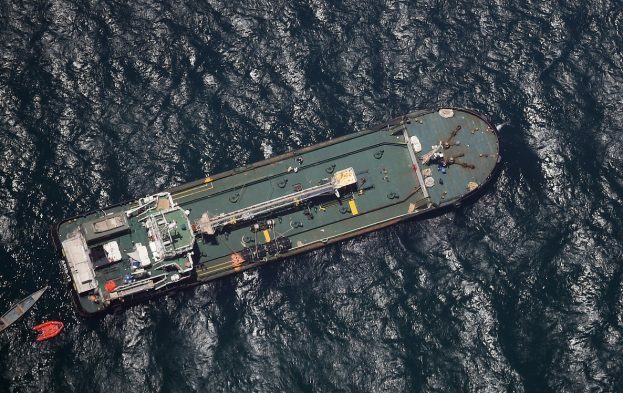 And though Somali pirates quickly shifted their focus toward more lucrative vessels, such as cargo ships and oil tankers, piracy appears to have caused many foreign fishing vessels to leave the area during the mid-2000s. 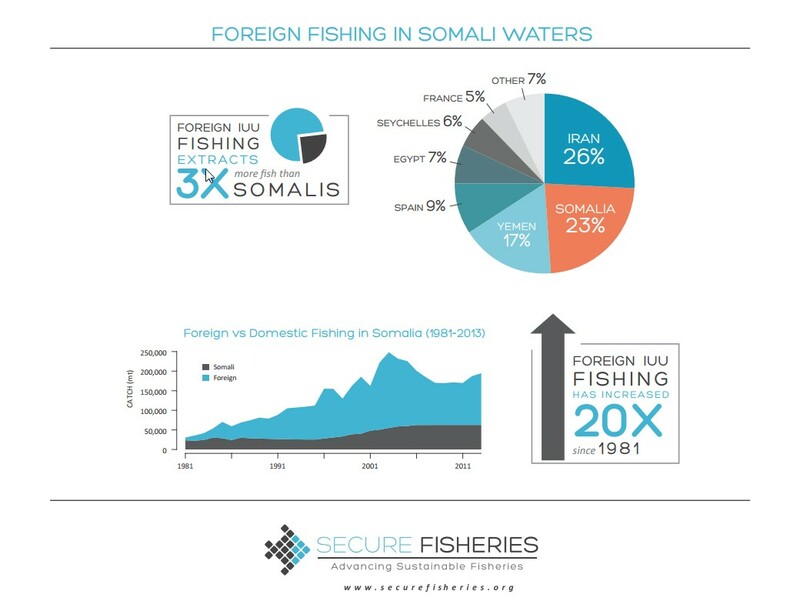 Above: A diagram from the Secure Fisheries report which indicates foreign fishing in Somali waters. The report says that the locals say the attacks will continue and blame their government in the semi-autonomous Puntland region for granting foreigners permits to fish in Somali waters. “Since the fish are drained by foreigners, my colleagues plan to go into the ocean to hijack other ships. We have no government to speak on our behalf,” said fisherman Mohamed Ismail. Above: Aris13. This is the vessel that was hijacked in 2017 the first in many years. 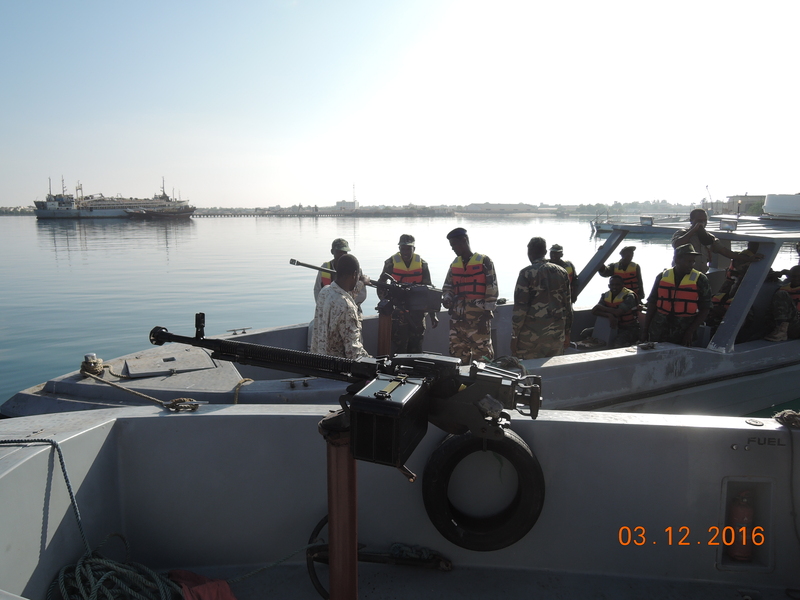 “Somaliland has a coastguard and some basic boats for day patrolling. They are without overnighting or stay at sea capacity. In Bosaso you have Maritime or Port police, who only patrol in the immediate area of the port in small skiffs and you have the Puntland Maritime Police Force who are probably the most developed maritime security agency, they are supported directly by the Puntland President and they are funded directly by the UAE. They have decent boats, they have got decent facilities and have been known to do search and rescue, fisheries enforcement and migration interdiction. This is only a part of their job. They are directly involved in the fight against Al Shabaab and more frequently now Deash, who have developed a stronghold in the mountains above Bosaso. Glamudug has a coastguard but really, they are just a militia with a couple of boats. Their big focus is illegal fishing, mainly against Yemenis and Iranians coming in, so they are arresting a lot of fishing boats and demanding fines of them. 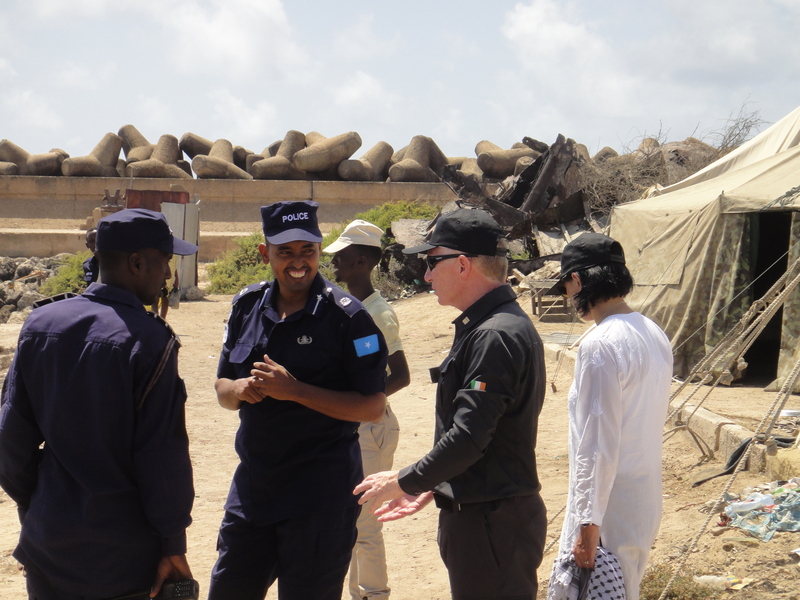 In Mogadishu, within its boundary area, you have the Navy/Coast Guard and the Maritime Police. The maritime police have jurisdiction out to 12 miles. They have not decided what they want to do yet with their Navy/Coast Guard, they had a Navy in the days of the USSR, that is gone. They have the Admiral of the Navy and he has two Vice-Admirals but they have absolutely nothing in place. Above: Chris speaks to some officers of the port police, building relationships is a key part of establishing solid foundations for good work. The international community are saying that ‘Somalia doesn’t need a Navy, develop a coast guard because that’s what you need’. The Navy have a couple of boats given by Turkey and the maritime police in Mogadishu have a couple of boats given by UAE. They have no classrooms, training rooms, accommodation or meeting rooms. “Because the easiest thing to do is go out and buy ships. The hardest part is the ability to maintain a ship at sea, to be able to maintain its engines, having somewhere to train its staff and for crews to sleep. Then you need an officer corps who can manage it and a maintenance corps to keep it running. I finished by asking Mr. Reynolds did he feel that this project can succeed and how did the Somalis he works with view it, his answer was swift and positive. Next Post Ship Shape and Ready for Action.